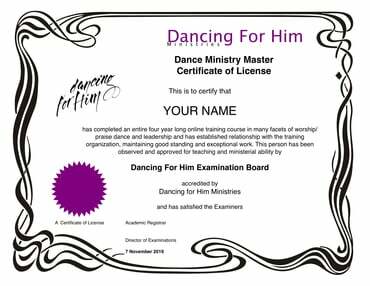 Those who desire to join the Dancing For Him On Line School that begins January 10th may make an initial payment of $125 followed by subsequent payments in $100 increments before school begins. Payments must be completed on or before December 31st. There will be absolutely no exceptions nor extentions. The payments are non-refundable. That means if you will not have completed your full registration by December 31st, any payments you will have already paid, will become a donation to the ministry and you'll need to start over. Don't wait until the last minute. All payments must be completely finished by December 31st. The pre-payments will only hold your place in class. However, the full $325 tuition must be paid in full on or before December 31st in order for you to be considered completly registered for the school. You may make your pre-payments with an initial $125 and then subsequent payments in multiples of $100 by putting a 2, 3 or 4 in the quantity box. This means if you put a 1 in the quantity box, you will be charged $100. If you put a 2 in the $100 quantity box, you will have just paid $200. If you put a 3 in the quantity box, the system will withdrawl $300 and so on. CLICK HERE to make your initial payment of $125. Then come back here to make subsequent payments of $100 each until tuition for Level 3 is paid in full, on or before December 31st. We will put your name on a secondary roster and keep track of your payments. Once you have completed your payments to pay your tuition in full ($325), then we will create a folder for you and put you on the primary roster. You will then (on or around January 10th), also receive your welcome letter, student information page link, private Facebook page and chat phone number or webinar information. In consideration of participation in this dance program and instruction, I/we the undersigned (electronic registrant) intend to be legally bound, here by for myself and anyone acting on my behalf, as well as all others from whom I am registering (if any), all those participating with me in any assignments/practice, etc., release all claims for damages i/we may have against Dancing For Him Ministries, Inc., Lynn Hayden and their sponsors, representatives, successors, and assigns for any and all injuries or death suffered by me/us in this program. I/we attest and verify that I/we know participation in this program/event can be a potentially hazardous activity. However, I/we have sufficiently prepared for this course/event, understand the necessity of proper warming of the muscles before activity, and know that I/we am/are participating at my/our own risk. The waiver extends for the duration of the program dates there which are listed on the school information pages. I also release DFH use of any photographs or video footage of me/us. I/we have read and understand this waiver of liability, and agree to the same, by selecting ‘Yes’ in the appropriate place on this page.